This month i will be taking part in a reading challenge (adding to all the others I'm doing"). it’s called Book Binge and her are the rules. I am taking part in this for a few reason. To pimp my blog – hey anything to get recognised. In my never ending “Quest” to get people to read – hopefully something someone reads or find out from my blog or courtesy of my blog (so everyone, shape up you never know who will be visiting) will make a difference. To put another genre of book out their for people to read, i will more than likely find a whole new world open to me as well. I will be keeping you guys updated. And lastly – it’s as easy as it can get – I do the same thing at the end of the month so no big thing – If you guys have time – come over and join. 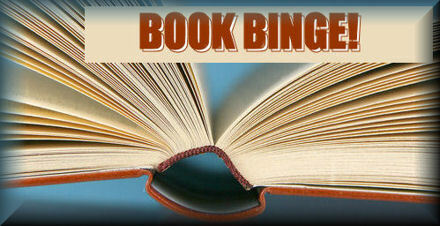 Click on the Book Binge to get involved. Lovely to see a friend joining..